Chances are if you are reading a publication like The Advocate and you are a young person you already are active in this community. 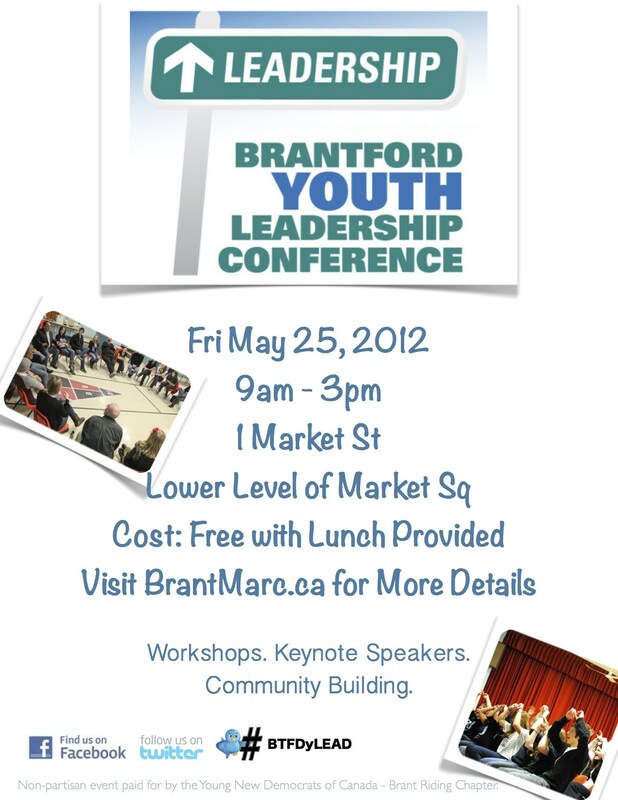 On Friday May 25th, the Brant Young New Democrats (YNDP) will be holding its 2nd annual Brantford Youth Leadership Conference at Freedom House, open to high school youth in the community. The conference is a non-partisan and free event which hopes to inspire young people to get involved and take leadership roles within their community, while honing the skills of the many talented young leaders who are already active in our community. Although the event is organized by the Brant Young New Democrats, we stress that it is open to all high-school aged youth who have interests in leadership. It is entirely non-partisan in its nature and is supported by people of all political stripes. Its purpose is to help develop leadership skills in all local, interested young people and not to push political opinions on the participants. Last year’s leadership conference was the first time that the event was organized and it was a successful day with many engaged youth attending. It featured many guest speakers from various political stripes and organizations in the community. The conference gave youth in Brantford the opportunity to meet and hear from leaders such as Mayor Chris Friel, community activist and (at the time) federal candidate Marc Laferriere, Captain Kindness Dave Carroll , and the winner of CBC’s Next Great Prime Minister contest, Amy Robichaud – all inspiring individuals who took leadership roles at a young age. Group discussion at the end of the day was proof that participants were engaged, inspired, and motivated to become even more involved in their communities. With the great success of last year’s conference, we are striving to make this year’s Youth Leadership Conference even bigger and better. In order to reach even more youth, we will be inviting students from all of the local high schools and from several community organizations for the free and full day event. As two involved young people in Brantford, we believe that youth leadership is extremely important for the future of the community. Young people are the next leaders and decision makers of tomorrow, but we strongly believe that young people can, and are making an impact today. This year’s leadership conference will feature newly elected MPP Jagmeet Singh from Brampton, former Brant MPP and environmental activist Phil Gillies, 21-year-old Six Nations Elected Council Member Mark Hill, 25-year-old Brockville city councillor Leigh Bursey and many others. All of our presenters and workshop hosts are adults who have had their own experiences as young leaders. Some of the topics which will be featured at the leadership conference include volunteerism, social media, art and political activism. We hope that students will find these different topics interesting, engaging, and beneficial. Not only is the leadership conference an opportunity for students to hear from community leaders and activists, but it is also a chance for students to voice their ideas. We know that so many young people have incredible ideas and valuable opinions on issues, and we look forward to hearing their input and helping them learn ways they can effectively communicate and organize. Young people can often feel left out or powerless when it comes to having a voice. Sometimes it can be difficult to feel that your opinion is heard and that as a young person you can actually make a difference. We want to prove those beliefs wrong. One of the main focuses of this event is to embrace the input that youth leaders have and put them in a room filled with those who are like-minded. Who knows what partnerships between young people can be created? Although when you are on your own it can seem impossible to create change, when joined by many others, people start to listen and change will happen. While we are looking for representation from each of the area high schools, we gladly invite any interested students to attend. Our goal is that students will leave the conference with tools and inspiration to become leaders and make a difference in their homes, schools, and community. So if you are a young person reading this and you want to hear from inspiring speakers, have the opportunity to participate in interactive workshops and meet other local young people we hope you’ll join us and help make this an annual Brantford tradition.